Laser electrospray mass spectrometry (LEMS) measurement of the dissociation constant (Kd) for hen egg white lysozyme (HEWL) and N,N′,N″-triacetylchitotriose (NAG3) revealed an apparent Kd value of 313.2 ± 25.9 μM for the ligand titration method. Similar measurements for N,N′,N″,N″’-tetraacetylchitotetraose (NAG4) revealed an apparent Kd of 249.3 ± 13.6 μM. An electrospray ionization mass spectrometry (ESI-MS) experiment determined a Kd value of 9.8 ± 0.6 μM. In a second LEMS approach, a calibrated measurement was used to determine a Kd value of 6.8 ± 1.5 μM for NAG3. The capture efficiency of LEMS was measured to be 3.6 ± 1.8% and is defined as the fraction of LEMS sample detected after merging with the ESI plume. When the dilution is factored into the ligand titration measurement, the adjusted Kd value was 11.3 μM for NAG3 and 9.0 μM for NAG4. The calibration method for measuring Kd developed in this study can be applied to solutions containing unknown analyte concentrations. The online version of this article ( https://doi.org/10.1007/s13361-018-1935-9) contains supplementary material, which is available to authorized users. where [P]eq is the concentration of free protein, [L]eq is the concentration of free ligand, and [PL]eq is the concentration of protein-ligand in solution equilibrium. When ESI-MS is used to determine Kd, the mass spectrometer is typically tuned to detect the peaks corresponding to the free protein and the protein-ligand complex, and the free ligand is not measured [2, 7, 8, 9, 10]. In such measurements, the concentration of the protein is kept constant and the ligand is titrated into the ESI solution. A plot of [PL]eq/[P]eq vs. [L]eq yields a straight line with its slope, m = 1/Kd. The value for [PL]eq/[P]eq is obtained directly from the mass spectra while [L]eq is calculated by subtracting the concentration of the protein-ligand complex from the initial ligand concentration [2, 9]. ESI-based techniques employed to study solution-based non-covalent molecular interactions have limitations [8, 11, 12, 13]. Desolvation during electrospray affects both intra- and inter-molecular electrostatic, H-bonding, and hydrophobic interactions . One assumption is that the ion intensity of the observed complex and free molecule(s) represents an accurate measure of the relative solution phase concentrations [14, 15, 16]. Investigations have yielded binding strengths ranging from 6.0 ± 1.0 μM to 59.8 ± 17.6 μM for complexes of hen egg white lysozyme (HEWL) and N,N′,N″-triacetylchitotriose (NAG3) [2, 8, 17, 18]. Laser-ESI hybrid techniques allow the decoupling of sampling and ionization steps . Analyte sampling via desorption may occur by resonant matrix absorption of photon energy , thermal ablation [19, 21], or non-resonant multi-photon absorption . ESI solution/solvents can be independently changed to control analyte ionization and charge distribution [23, 24]. Hybrid systems enable direct sampling of surfaces [19, 21, 22, 25, 26], enhanced quantitative analysis [19, 27], spatially resolved analysis [19, 28, 29, 30, 31, 32], and rapid throughput analysis . Laser-assisted electrospray ionization (LAESI) has been used to analyze the interaction between human amylin and copper (II) ions for which an apparent Kd value was measured , that was an order of magnitude larger than that determined by fluorescence spectroscopy . In the LAESI experiment, Kd values were calculated using the same titration method employed for ESI studies. During the analysis of solution-based analytes by laser-ESI hybrid techniques, droplets generated by laser ejection are captured by charged droplets emerging from the ESI source [21, 22]. The union of these droplets causes a dilution of the original sample droplets followed by an increase in concentration as the solvent evaporates. The time lapse between the merging of the droplets and full desolvation is estimated to occur within a few milliseconds [24, 35]. This may be long enough for re-equilibration to occur between the non-covalent complex and free protein and ligand because the mechanical motions of lysozyme molecules required for substrate binding or release occurs within ~ 40 μs . To measure accurate values for binding strengths using a laser-ESI hybrid technique, the concentration of the analytes within the droplets prior to desolvation should be considered. Laser electrospray mass spectrometry (LEMS) is an ambient sampling technique that employs femtosecond, near-IR laser pulses to non-discriminately vaporized samples . Unlike most other laser hybrid techniques, LEMS does not require sample preparation . This attribute is important for investigating non-covalent protein-ligand interactions because sample preparation such as the addition of matrix molecules  or dehydration  typically denatures protein and reduces the ability to bind substrate. Hence, sample preparation may hamper the accurate measurement of binding strengths. Analytes investigated using LEMS acquire the same or less internal energy as those investigated using conventional ESI [37, 38]. LEMS has been used to successfully investigate lipids , proteins [22, 32, 40], and both wet and dry samples containing other biologically relevant analytes . LEMS has been used to qualitatively investigate the non-covalent interactions between myoglobin and heme , and can yield quantitative analysis of surfaces  and mixtures  that is superior to conventional ESI. These studies suggest that the determination of non-covalent binding strengths using LEMS may be feasible. We report here a new method by which LEMS can be used to quantitatively probe non-covalent interactions and binding strengths between the protein, hen egg white lysozyme (HEWL), and its ligand, N,N′,N″-triacetylchitotriose (NAG3). We measure an ESI calibration curve for NAG3 in the presence of an internal standard to account for ESI intensity fluctuations and to determine the concentration of NAG3 in the merged droplets. LEMS analysis was then performed on solutions containing a constant HEWL concentration and various concentrations of NAG3. For comparison, we also investigated via separate LEMS and ESI titration methods using only protein measurements for calculation of Kd. The quantitative LEMS method reported here will allow Kd measurements to be made from samples of unknown concentrations. This has never been demonstrated by any other MS method. This method may be preferred to conventional ESI as it can also be applied for analysis of protein complexes directly from biological tissue surfaces, providing additional spatial information that would not be available if the sample is homogenized to perform conventional ESI measurements. Aqueous stock solutions of 5.0 mM NAG3, 5.0 mM N,N′,N″,N″’-tetracetylchitotetraose, NAG4 (V-Labs Inc., Covington, LA, USA), 50.0 mM ammonium acetate (Sigma Aldrich, St. Louis, MO, USA), 4.0 mM 1,2-dihexanoyl-sn-glycero-3-phosphocholine DHPC (Avanti Polar Lipids, Inc., Alabaster, AL, USA), and 2.5 mM HEWL (Sigma Aldrich, St. Louis, MO, USA) were prepared in HPLC grade water (Fisher Scientific, Pittsburgh, PA, USA). All LEMS samples were prepared by combining and diluting stock solutions of HEWL and NAG3 to create samples with a concentration of 250 μM HEWL and concentrations ranging from 0 to 500 μM NAG3. The electrospray solvent used for Kd measurements by the LEMS ligand titration method was prepared by diluting the stock ammonium acetate solution with HPLC grade water to achieve a final concentration of 25 mM. The electrospray solvents used to calibrate the ligand intensity were prepared by combining and diluting stock solutions of ammonium acetate, DHPC, and NAG3, to create electrospray solutions of 25.0 mM ammonium acetate, 400 nM DHPC, and concentrations ranging from 500 nM to 10 μM of NAG3. The electrospray solvent used to measure Kd by the calibrated NAG3 intensities contained 25.0 mM aqueous ammonium acetate and 400 nM DHPC. ESI ligand titration experiments were performed by combining and diluting stock solutions to create ESI samples of 10.0 μM HEWL and concentrations ranging from 2.0 to 10.0 μM NAG3 with 25.0 mM ammonium acetate and 400 nM DHPC. The instrumentation for laser vaporization, electrospray ionization, and mass spectral detection has been previously described in detail . A Ti:sapphire laser oscillator (KM Laboratories, Boulder, CO, USA) seeded a regenerative amplifier (Coherent, Inc., Santa Clara, CA) to create a 2.5 mJ pulse centered at 800 nm with a duration of 70 fs, operating at 10 Hz to couple with the electrospray ion source. The laser was focused to a spot size of ∼ 300 μM in diameter using a 16.9 cm focal length lens with an incident angle of 45° with respect to the sample. The intensity of the laser at the substrate was approximately 2 × 1013 W/cm2. The steel sample plate was biased to − 2.0 kV to compensate for the distortion of the electric field between the capillary and the needle caused by the sample stage. The area sampled was 6.4 mm below and 2 mm in front of the electrospray needle. The distance between the electrospray needle and the mass spectrometer inlet was 6.4 mm. Protein-ligand sample solutions were prepared by serial dilutions of stock solutions to achieve a final protein concentration of 250 μM while ligand concentration was varied from 0 to 250 μM. An aliquot of 6 μL sample solution was deposited unto a sample plate and then exposed to the focused laser beam until the entire sample was vaporized (~ 5 s). The sample was ejected in a direction perpendicular to the electrospray plume, where capture and ionization occurred. The electrospray solution was pumped at a flow rate of 3 μL/min using a syringe pump (Harvard Apparatus, Holliston, MA, USA). The electrospray needle, with an internal diameter of 127 μM, was kept at ground. The MS inlet was biased to − 4.5 kV. A countercurrent of nitrogen gas (180 °C) flowed at 4 L/min to assist the desolvation process. The vaporized and post-ionized analytes were analyzed by a high-resolution mass spectrometer (Bruker MicroTOF-Q II, Bruker Daltonics, Billerica, Germany) which was tuned for a wide m/z range (m/z between 200 and 2500). Prior to LEMS experiments, the mass spectrometer was calibrated with a solution of 99:1 (v/v) acetonitrile/ESI calibrant (#63606-10 ML, Fluka Analytical/ Sigma Aldrich, Buchs, Switzerland) over a mass range of m/z 50-3000. Raw spectra were recorded at a rate of 1 Hz and then averaged, processed, and analyzed using Compass Data Analysis 4.0 Software by Bruker Daltonics. To perform the LEMS measurement of Kd for the HEWL-NAG3 complex, an aqueous solution containing 250 μM of HEWL was first laser vaporized into an ESI plume containing 25 mM ammonium acetate. The LEMS spectrum contained two dominant ion features at m/z 1789.1 and 2044.6 which correspond to [M + 8H]8+ and [M + 7H]7+, respectively (Figure 1a) suggesting that the HEWL is in the native, folded conformation in the droplets. Two minor ion features were also detected at m/z 1590.4 and 2385.1 which correspond to [M + 9H]9+ and [M + 6H]6+, respectively (Figure 1a) LEMS of HEWL revealed a deconvoluted molar mass of ~ 14,304.8 amu which is in agreement with the molar mass of 14,304.7 amu obtained from an ESI experiment and the theoretical molar mass of HEWL of ~ 14,305.1 amu . A 6 μL aliquot of 250 μM HEWL sample solution containing 0 to 250 μM NAG3 was deposited onto the sample stage and laser vaporized into an aqueous ESI plume containing 25 mM ammonium acetate. LEMS analysis of a solution of HEWL and NAG3 revealed three major additional ion signals (Figure 1b–f). The peaks at m/z 1867.6 and 2134.3 correspond to the HEWL-NAG3 complex [M + 8H]8+ and [M + 7H]7+ charge states, respectively (see Figure 1), and a peak at m/z 628.3 (not shown) that corresponds to free NAG3. Two additional minor ion signals at m/z 1660.2 and 2489.8 corresponds to the HEWL-NAG3 complex [M + 9H]9+ and [M + 6H]6+ charge states, respectively (Figure 1b–f) These LEMS measurements reveal that the deconvoluted molar mass of the complex between HEWL and NAG3 is 14,932.8 amu. The difference in the measured mass between HEWL and HEWL-NAG3 complex is 628.0 amu which is in agreement with the molar mass of NAG3 (627.6 amu). where [L] i is the initial concentration of NAG3 and [P] i is the initial concentration of HEWL and the denominator on the right side represents the concentration of free NAG3. In this approach, the MS peak intensity of free NAG3 is not considered, instead the denominator in Eq. 3 is used to calculate the concentration of free NAG3. Inspection of Figure 1b–f reveals that the ion intensities for the complex at m/z 1867.6 and 2134.3 increases as the total NAG3 concentration increases. The R value was plotted as a function of the concentration of free ligand in Figure 2 and the inverse of the slope of the best-fit line (m−1) represents Kd. In the construction of the best-fit line, each point was weighted based on the inverse square of the error bars. The apparent Kd value for HEWL-NAG3 complex was 313.2 ± 25.9 μM (Table 1). This value is almost two times larger than the Kd value of 169.1 μM measured by reactive desorption electrospray ionization mass spectrometry (DESI-MS). In the reactive DESI experiment, the mixing of HEWL and NAG3 occurred after the Taylor cone and the large Kd value was attributed due to poor mixing within the droplets . A Kd value of 11.1 μM was measured by isothermal titration calorimetry (ITC), which is considered the standard for quantifying protein-carbohydrate interactions . The Kd value of the HEWL-NAG4 complex was determined to further test the method. LEMS spectra of HEWL and NAG4 are shown in supplementary Fig. S1. Ion signals corresponding to free HEWL and HEWL-NAG4 complex were detected for charge states ranging from 9+ to 6+. From these measurements, a titration plot was constructed as shown in supplementary Fig. S2 and the inverse of the slope revealed an apparent Kd value of 249.3 ± 13.6 μM for HEWL-NAG4 complex. As in the NAG3 experiment, the apparent value for the Kd of HEWL-NAG4 complex is more than an order of magnitude larger than the Kd value of 9.1 μM measured by isothermal titration calorimetry (ITC) . The apparent Kd for NAG4 is less than that for NAG3 and is consistent with the decrease in Kd from NAG3 to NAG4 that has been previously reported [2, 45]. As a comparison to the apparent Kd value measured via the LEMS titration experiment, an ESI titration experiment was carried out to measure the Kd value of the HEWL-NAG3 complex. ESI solutions of 25.0 mM ammonium acetate, 400 nM 1,2-dihexanoyl-sn-glycero-3-phosphocholine (DHPC) used as an internal standard, 10.0 μM HEWL, and concentrations ranging from 2.0 μM to 10.0 μM of NAG3 were prepared and analyzed. A shift to higher charge states was observed with increasing ligand concentration with saturation in the shift occurring at approximately 8.0 μM (Figure 3). A shift in charge state distribution was not observed in the LEMS measurements which were taken at concentrations that were an order of magnitude higher than the ESI measurements (Figure 1). This shift in charge state coincides with a previously reported change in the conformation of lysozyme in the presence of a substrate . Charge states corresponding to [M + 6H]6+, [M + 7H]7+, [M + 8H]8+, and [M + 9H]9+ were used in Eqs. 2 and 3. To determine Kd, the R value was plotted as a function of the concentration of free ligand in Figure 4. In the construction of the best-fit line, each point was weighted based on the inverse square of the error bars. The Kd value for HEWL-NAG3 complex was 9.8 ± 0.6 μM which is in agreement with the Kd value of 11.1 μM measured by ITC . This suggests that the large apparent Kd value measured in the LEMS experiment is not due to dissociation of the complex in the gas phase. Two plots were constructed to analyze the system response between the measured ion signal intensity of free NAG3 and the calculated concentration of free NAG3 based on the denominator of Eq. 3. A plot of the measured ion signal intensity of NAG3 (m/z 628.3) as a function of the calculated concentration of free NAG3 revealed poor linearity, with an R2 value of 0.50 as shown in supplementary Fig. S4. Conversely, a plot of the ion signal intensity of NAG3 divided by the ion signal intensity of the internal standard DHPC (m/z 454.3) as a function of the calculated concentration of free NAG3 revealed better linearity with an R2 value of 0.79 as shown in Figure 5. A calibration curve for the ESI response of NAG3 was measured to determine the concentration of free ligand in the droplet after laser vaporization. The concentration of free ligand can then be used to further refine Kd. ESI solutions were prepared with concentrations of NAG3 varying between 500 nM and 10 μM. The lipid 1,2-dihexanoyl-sn-glycero-3-phosphocholine (DHPC) was used as an internal standard at a concentration of 400 nM in 25 mM ammonium acetate to normalize for variation in the ESI signal intensities. The relative intensity ratio of NAG3 and internal standard was plotted as a function of the concentration of NAG3 to produce the calibration curve. The resulting spectra show a linear increase in the intensity of the NAG3 ion at m/z 628.3 relative to the DHPC ion at m/z 454.3 as the NAG3 concentration is increased (Figure 6). A plot of the intensity of NAG3 (m/z 628.3) divided by the intensity DHPC (m/z 454.3) as a function of the known concentration of NAG3 reveals an R2 value of 0.99, as shown in Figure 7. For comparison, a plot of the ion intensity of NAG3 as a function of concentration without consideration of the internal standard reveals an R2 value of 0.15 as shown in supplementary Fig. S3, presumably due to variation in the ESI system. An internal standard was not considered for calibrating the absolute signal intensities of HEWL and HEWL-NAG3 complex because the ratio of the relative intensities of the mass spectral responses observed for both species reflects the ratio of HEWL to HEWL-NAG3 complexes assuming the instrument response function is the same for each species. The concentration of free ligand captured within the ESI plume, [L] capt , during the analysis of HEWL-NAG3 solutions was determined by Eq. 4, which was obtained from the best-fit line of the NAG3 calibration curve in Figure 7.
where (I)NAG3 represents the intensity of NAG3 and (I)DHPC represents the intensity of DHPC (internal standard), 0.034 is the value of the y-intercept of Figure 7 and 128,114 L/mol is the slope of the data in Figure 7. LEMS analysis was performed on 6 μL aliquots of aqueous solutions containing 250 μM lysozyme with concentrations varying from 100 to 500 μM NAG3. Samples were laser vaporized into an aqueous electrospray solution containing 400 nM of the internal standard and 25 mM ammonium acetate. The resulting spectra contained features corresponding to DHPC, NAG3, the 7+, 8+, and 9+ charge states of HEWL, and the corresponding charge states of HEWL-NAG3 complex (Figure 8). The ratio between the detected free NAG3 and internal standard intensities was used to determine the concentration of free NAG3 within the ESI droplet, [L] capt . The Kd values were then determined using [L] capt and the ratio of the intensities of HEWL-NAG3 complex and free HEWL (Eq. 5). Three measurements were made for each concentration and the averages of these values were then used to determine Kd. The Kd values ranged from 5.1 to 8.4 μM (Table 2). These results are in agreement with other studies as seen in Table 1. The much higher Kd value measured by LEMS without [L] capt suggests that there is a re-equilibrium between the HEWL and NAG3 after merging of the laser-vaporized droplets with the electrospray-generated droplets. where [L] drop represents the total concentration of ligand captured in the ESI plume, [L] i represents the initial ligand concentration in the LEMS sample, [P] drop represents the total concentration of protein captured in the ESI plume, and [P] i represents the initial protein concentration in the LEMS sample. Kd can be represented by the following equation using the droplet concentrations, [L] drop and [P] drop . We can solve for the value of [P] drop by substituting the expression for [L] drop in Eq. (6) into Eq. (7) to yield the following. where [L] adj is the value of the free ligand within the droplet assuming that 3.6% of the LEMS sample is captured. Using the dilution factor as similarly reported in a reactive DESI experiment , the original HEWL-NAG3 Kd value of 313.2 μM becomes 11.3 μM which is in agreement with values reported in literature (Table 1). The same dilution factor was used for HEWL-NAG4, providing a Kd value of 9.0 μM which is in agreement to the value of 9.1 μM reported for ITC measurements . We have used LEMS to study the non-covalent protein-ligand interaction between lysozyme and NAG3. We have used two different methods to solve for the Kd values. The first method used the ligand titration scheme that is generally used for ESI studies. This method yielded an apparent Kd value of 313.2 ± 25.9 μM which is more than an order of magnitude larger than the Kd values obtained via other conventional ESI-MS methods. An ESI ligand titration experiment was used to measure Kd value of 9.8 ± 0.6 μM. This suggests that in the LEMS experiment, dissociation of the complex is not occurring in the gas phase. We hypothesize that the apparent high Kd value measured with LEMS is because the capture efficiency and ESI droplet volume decreases the concentration of ligand and protein in the ESI droplets. Assuming the complex re-equilibrates, the decrease in concentration would increase the apparent Kd value. The second LEMS method accounts for the ligand concentration using an ESI calibration curve measured with an internal standard prior to LEMS analysis of protein-ligand solutions. The intensity of the free ligand relative to the internal standard was used to calculate the effective concentration of the ligand after the laser-vaporized sample was captured by electrospray droplets. 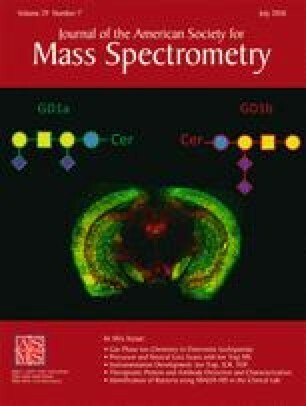 The effective ligand concentration was then used along with protein and protein-ligand complex MS signals to determine a Kd value of 6.8 ± 1.5 μM which is in agreement to other reported values. The calibration method can be used to probe solutions containing unknown analyte concentrations. The calibration also allowed the calculation of the capture efficiency of LEMS. The measurement suggested that ~ 3.6% of the original sample concentration is captured in the ESI plume. When this is factored into the original LEMS ligand titration experiments, the adjusted Kd values for NAG3 and NAG4 are 11.3 and 9.0 μM respectively. These values are also in agreement with previously reported ITC Kd measurements .